The Student Minds Awards celebrate all of our amazing volunteers' achievements over the last academic year. ​Congratulations to our 2018 Awards winners who have gone above and beyond to help us to transform the state of student mental health! 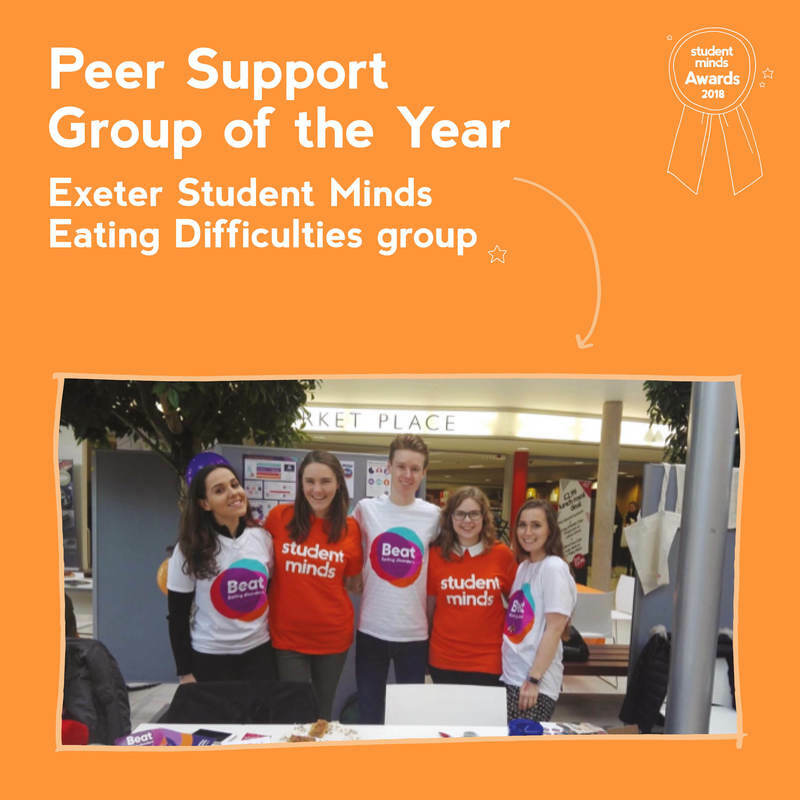 Exeter Student Minds Eating Difficulties group has effectively established themselves as a support group, becoming a reliable and important source of support within the university. The team have worked closely with a variety of individuals, including the VP Welfare, the Wellbeing Centre, Student Health Centre, and Beat campaign group, to allow for projects to have greater publicity, reach and impact. Using innovative ideas and approaches, the group is ensuring a sustainable and meaningful peer support group is available to students who need it for years to come. 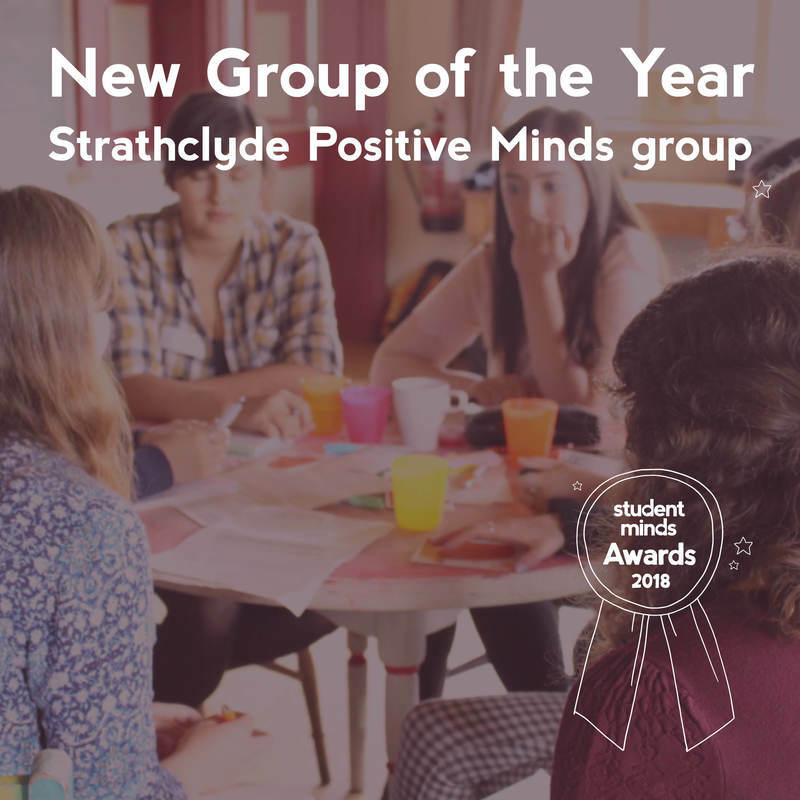 The Strathclyde Positive Minds team were trained in January and despite only having a week to arrange publicity before starting their sessions, they have consistently had high attendance and many repeat attendees. The team are particularly supportive of one another, sharing the workload effectively amongst the team. They have collaborated well with university and SU staff, as well as the Student Minds Campaigns Group on campus. They continually strive to develop and improve their facilitation skills and to make their sessions as engaging and interactive as possible. We are excited to see the group’s success in the next academic year. 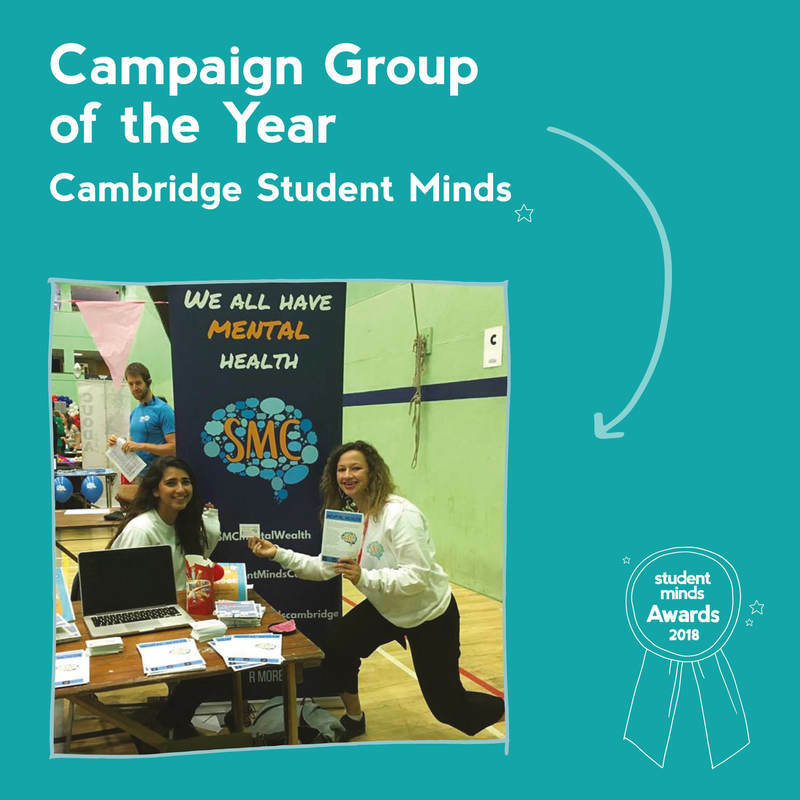 Student Minds Cambridge has worked tirelessly throughout the year campaigning for better understanding of mental health, where to get support and better provision for students. 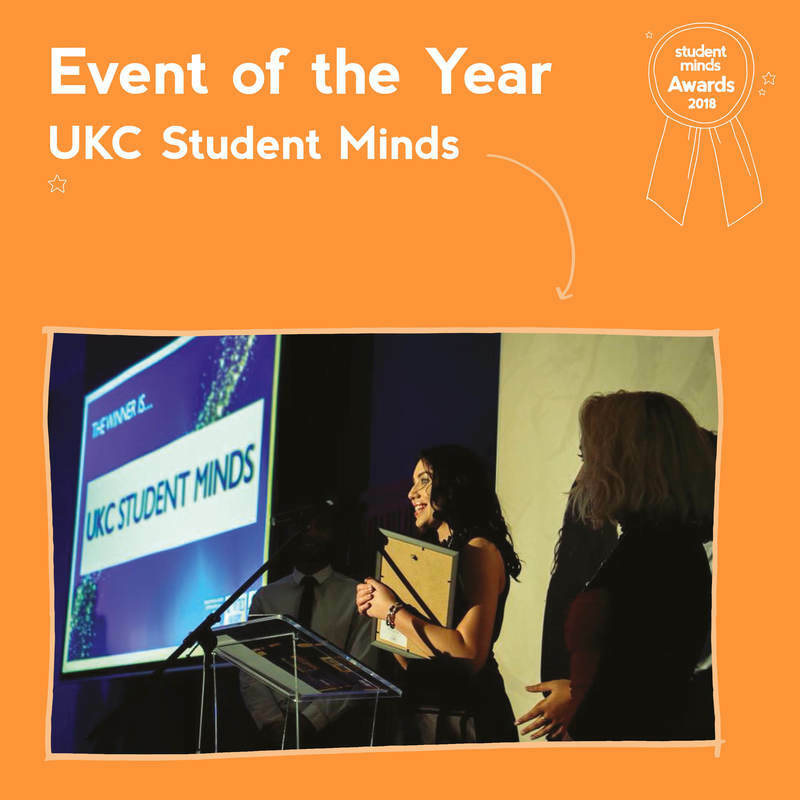 A large team of Students Minds volunteers coordinates regular successful events including a BME Mental Health Panel, art events, collaborations with other societies and comedy night. The committee also orchestrated successful online campaigns, such as #beingmemeans, a campaign focusing on intersection of identity and mental health with weeks devoted to BME and LGBT students. The committee’s hard work has seen a sharp rise in the profile of the group and student mental health on campus. 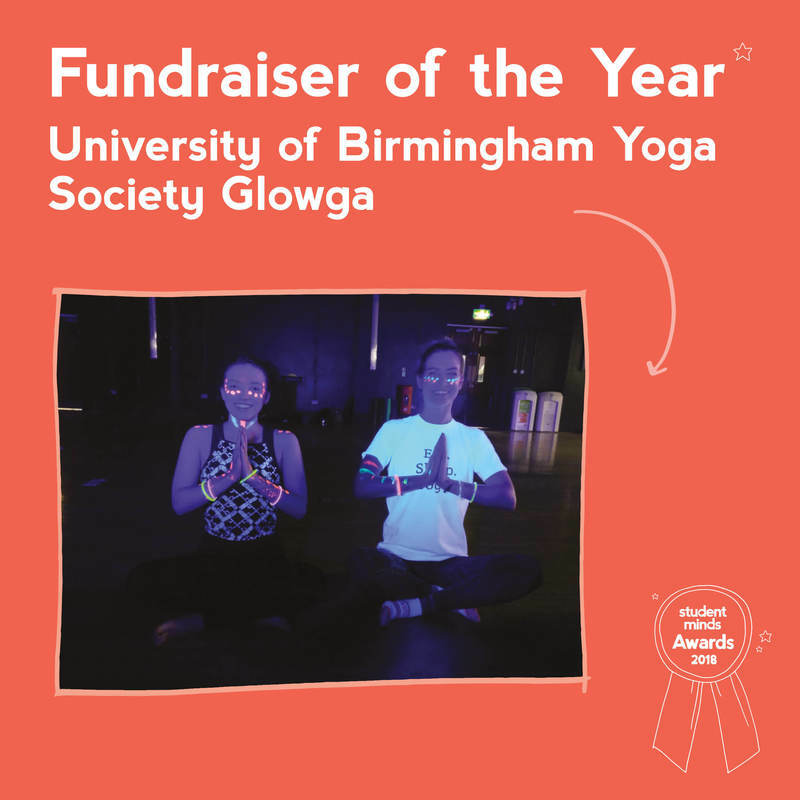 The University of Birmingham Yoga Society ran an inventive fundraiser; Glowga - a glow in the dark yoga class! Everyone had glow sticks, wore neon clothing and were able to relax and have a much needed break from their university work. Congratulations on raising £254.20 and having fun at the same time! University of Kent Canterbury Student Minds ran their “More Than A Diagnosis” campaign for World Mental Health Day, working effectively and collaborating with the University TV station, the Students’ Union, Kent University Support and Wellbeing team and Mental Health Group UKC. The campaign was designed to challenge the stigma around mental health and saw students posting positive messages, creating wellbeing boxes and taking part in art therapy. The day engaged with 100 people on campus and thousands more online in video views. 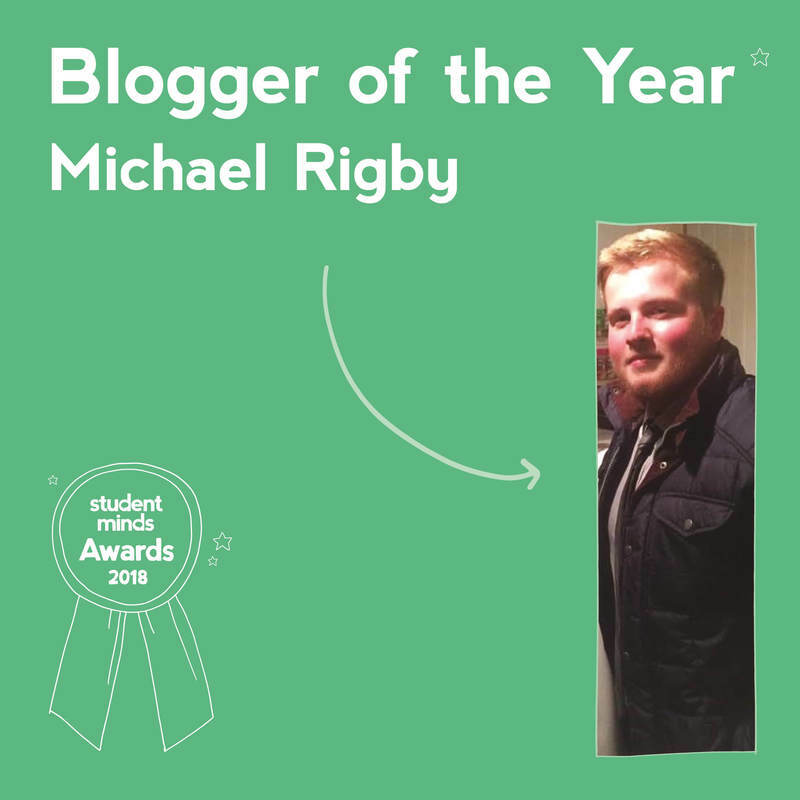 ​Nominated by the Student Minds Blog Editorial Team. 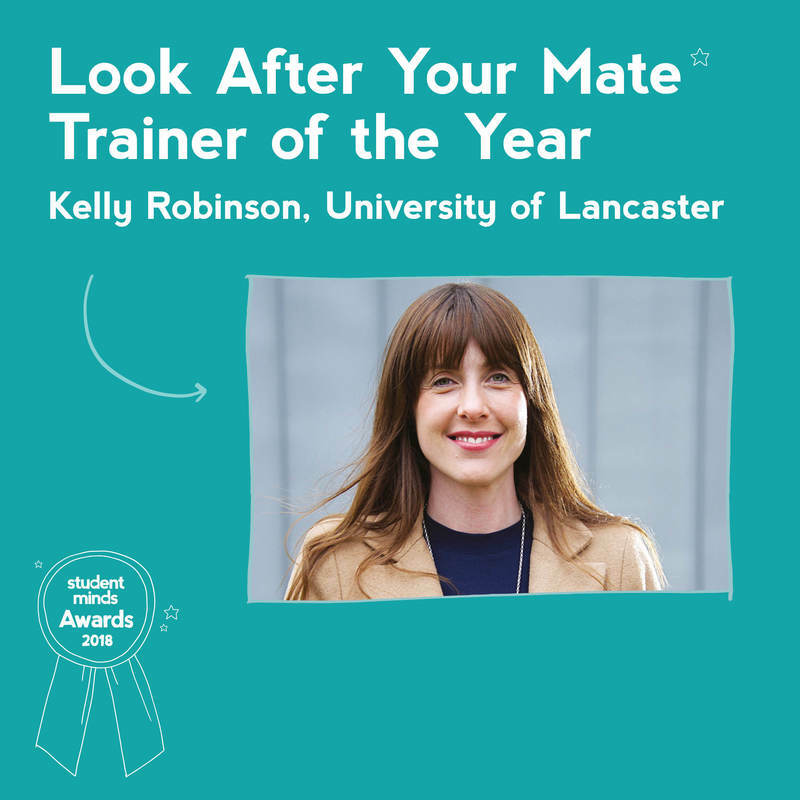 Kelly is an outstanding trainer, who has gone above and beyond her role expectation to make Lancaster really stand out as a university supporting student mental health through Look After Your Mate. Kelly took on board the increasing demand from students to access support services and identified the need for student workshops on mental health. Using an innovative approach of offering the opportunity of becoming a trainer to all university staff, Kelly has arranged for 35 staff to complete the training and deliver workshops. Kelly has organised and promoted every workshop, and championed impact measurement. Hundreds of students have been trained thanks to Kelly, and her hard work has absolutely paid off. 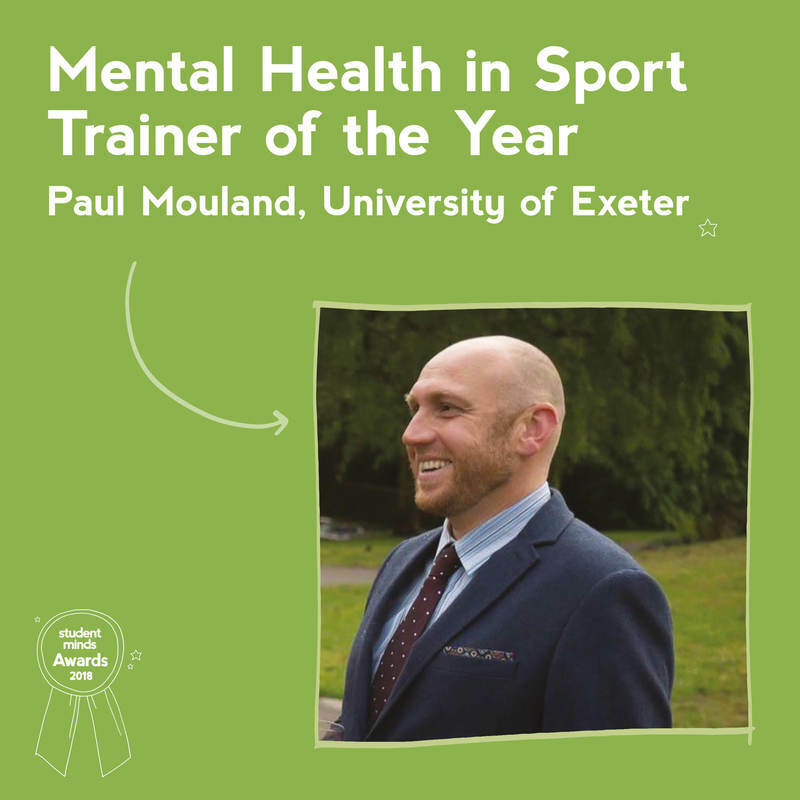 Paul has lead the University of Exeter Student Sport team to make exceptional strides forward in their support for students with mental health difficulties. With their desire to be the leading university for Mental Health in Sport training, they have incorporated it into their Club Committee training day, reaching over 400 students. The impact of the Mental Health in Sport project over the past 3 years has improved student wellbeing, fostering a new, more supportive sense of community and care within the sporting environment and culture. The programme will continue to grow and develop, and Paul deserves recognition for his determination, perseverance and enthusiasm. 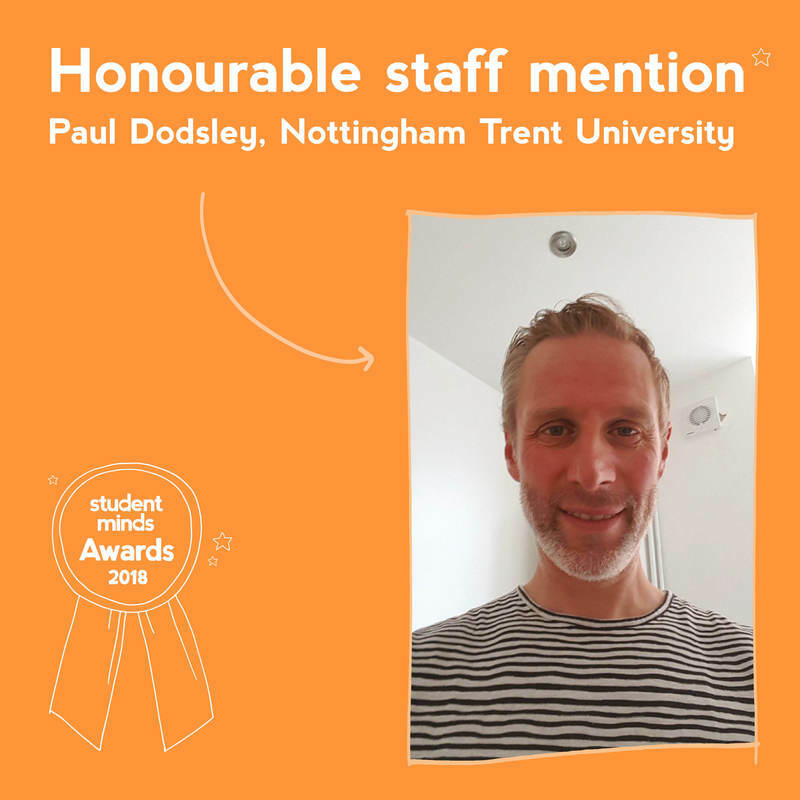 Paul has worked hard to support Student Minds both as a Look After Your Mate Trainer, and as an advocate for mental health and peer support at university. Paul helped to establish the Look After Your Mate programme at NTU, training 190 students to date. He supports the Student Minds Peer Support group and helped form a university Wellbeing Society. Paul has a clear passion for mental health, which comes across in his training and his support of Student Minds. Jess has been an amazing fundraising champion who has raised over £1000 this year, her events ranging from a fashion show to quiz nights have received great turnouts and she has always been excellent at promoting her events. 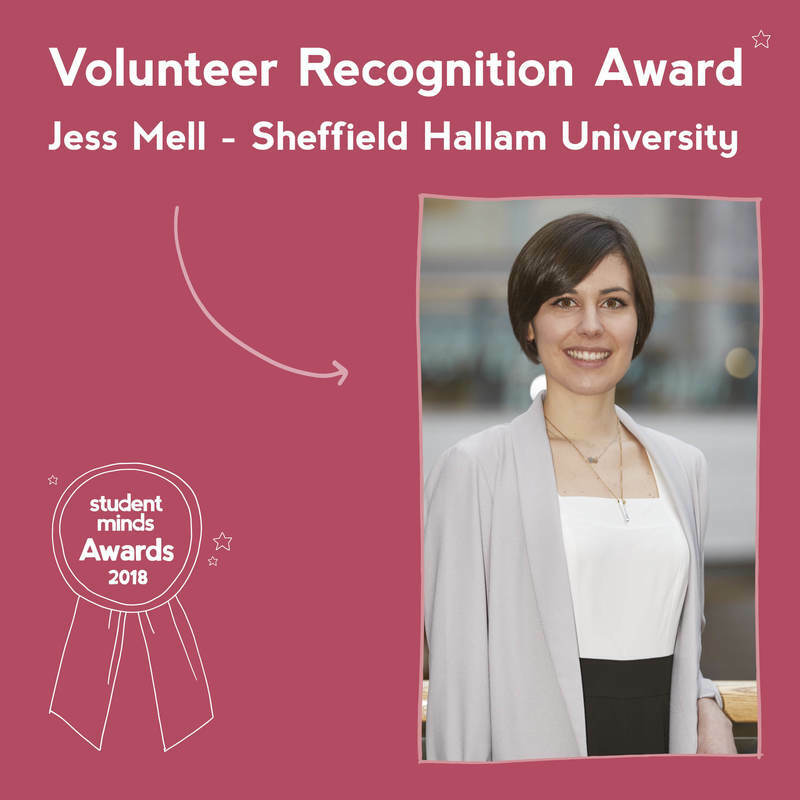 She is also the president of Sheffield Hallam SU Student Minds and has played an essential role in working with Sheffield Hallam university and their Student’s Union to raise consciousness of student mental health.One of Jess’ proudest moments came on University Mental Health Day 2018 where despite heavy snow, a planned inspirational speaker event went ahead and 100 people braved the weather to attend. 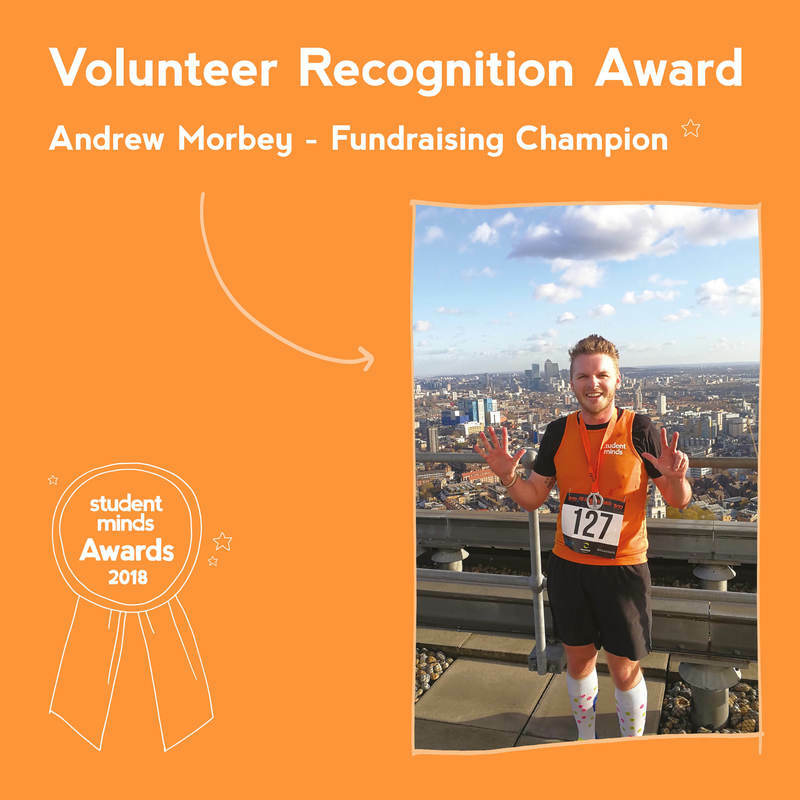 Andrew has raised over £1,500 for Student Minds this year. He took on the incredible challenge of running 12 runs in 12 months from a colour run, to climbing a vertical mile, to running a marathon! He constantly shares his experience of mental health difficulties and how the runs have gone in photos and videos on social media, which has been inspirational to see. 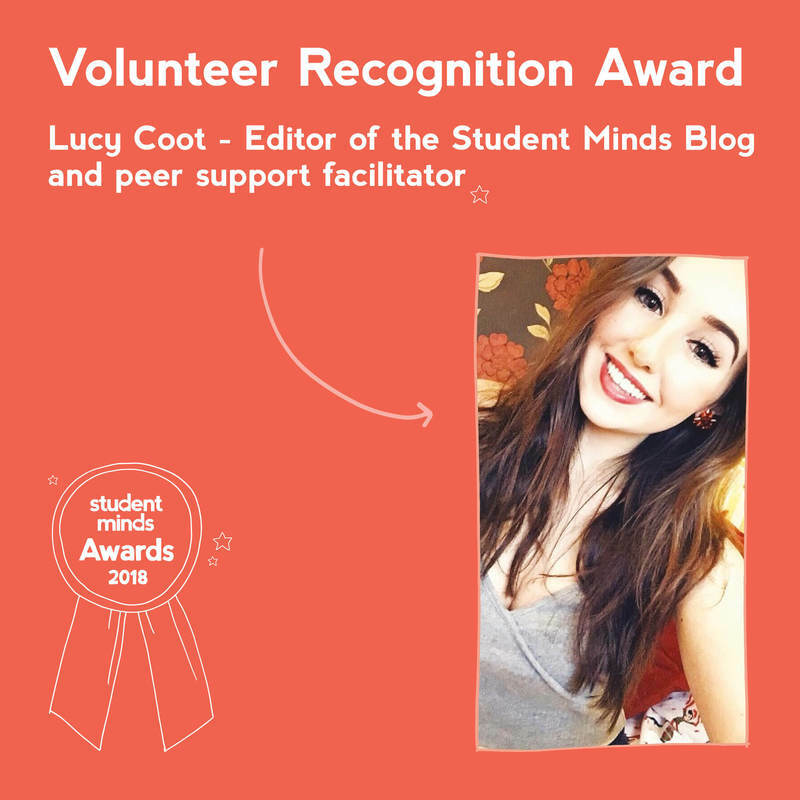 Lucy is the Editor of the Student Minds Blog and has done an amazing job of supporting our team of sub-editors to share over 103 student’s experiences with mental health difficulties at university. The blog has gone from strength to strength this year running blogging series from mental health over the summer to men’s mental health. Alongside this role, Lucy has coordinated the Anglia Ruskins Positive Minds peer support group and we’re excited that Lucy will be continuing her involvement with Student Minds following her graduation this summer as a peer support group Supervisor in the new academic year. 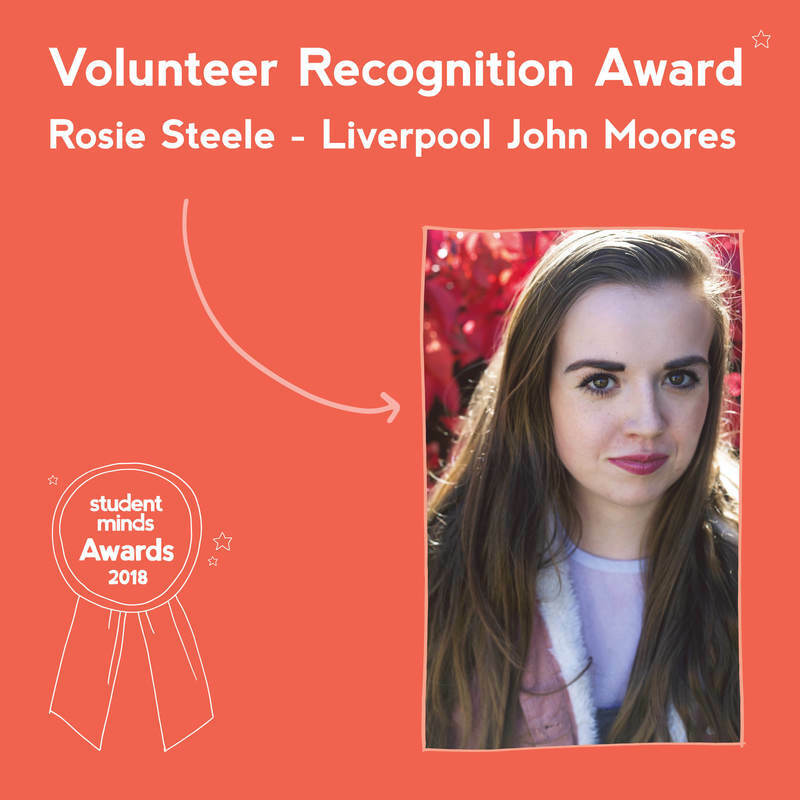 Rosie has been an excellent volunteer both in her role as a fundraising champion and the president of Liverpool John Moores Student Minds. She has been a driving force for creating change both on her campus and through blogging about her experiences of mental health difficulties at university. As President, Rosie has ensured that the society runs monthly events such as “Crafternoons”, Tea and Talk as well as promoting our national campaign “Best Night In”. Rosie has achieved all this and more whilst successfully negotiating the challenges that have come with being a new group on campus. Jan has worked extremely hard this year to coordinate the Southampton Eating Difficulties peer support group. He has created meaningful working relationships with key contacts on campus, effectively publicised the group through a variety of channels and supported the facilitator team to run engaging and successful sessions. Jan stays in regular contact with Student Minds and always shows motivation and dedication to the project.